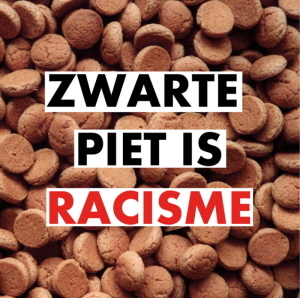 In 2016 Doorbraak activist Jennifer ‏van Leijen initiated a campaign to stop the Dutch government from subsidizing blackface (Zwarte Piet or Black Pete) on children’s television. More than 16.000 people already signed. Van Leijen regularly writes updates. Here is number 22 (also read numbers 1, 2, 3, 4, 5, 6/7, 8, 9, 10, 11, 12, 13, 14, 15, 16, 17, 18, 19, 20 and 21). It’s a tragic thing when an obviously racist phenomenon is “allowed”, especially when it’s allowed while ignoring the fact that it exists with state support. The entire judgement assumes that people want the racist caricature, whilst the government play no part in promoting it. Today, the judge in the Majority Perspective case permitted the NTR to continue with their racist caricatures. It was a flawed judgement, but will buy the Dutch state time till they are forced to change things for good. The judge has decreed that the image of Zwarte Piet is a legitimate expression of “an opinion”. The judge talked about the editorial choices of the NTR. The NTR has a strange interpretation of diversity: they believe that diversity equals pluralism (not integration), and that pluralism involves tolerance of racist ideas. That’s why the NTR talk about “mirroring society”. But mirroring society is not entirely a correct interpretation of the concept diversity. If that were so then an apartheids system could also be described as full of diversity! At this moment, it is estimated that 68 percent of the population wants Zwarte Piet. I’ve said it before, but I’ll say it again: in a healthy democracy, a respect for human rights means that minorities get to say “no” and that the “no” is accepted by all. The right to NOT be discriminated should (usually) weigh more than the right to freedom of expression. The NTR have also constructed their blackface storyline in a cunning way: they have included different people with the same characteristics, and they have introduced others with positive attributes. In this way, the NTR wants to argue that the stereotype doesn’t apply. The reality of the situation is 1) people have always associated a blackface Zwarte Piet with dark skinned people, especially people of African descent, despite being told that blackface was “soot from the chimney”. 2) the soot explanation is unbelievable because their clothes remain clean. 3) Is the glorification/normalisation of the institution of slavery appropriate in a children’s tradition? Zwarte Piet is an undeniable reference to slavery (crime against humanity), merely through the clothing. 4) Stereotypes are “accumulative”*, so if we have to judge Zwarte Piet, we need to look at Zwarte Piet during the entire history of the Sinterklaasjournaal, not just recent modifications! The truth is, the skewed Dutch interpretation of human rights means that people cannot expect justice from the Dutch judiciary. Lawyer Emil Tamas knew this and that’s why he expected that he would need to go to the European Court to receive real justice. The European Court will not agree that racism is an opinion. The European Court of Human Rights will not ask the question: “Should changes happen quickly or slower?” But the statement shall be: if racism, then immediately eliminate (the judge in the Majority Perspective said (wrongly) that there was no criterion!). The European Court of Human Rights have an elaborate and detailed understanding of what a television programme, designed for schools, should and should not encompass. The European Court of Human Rights has an extensive, elaborate and detailed interpretation of what diversity entails, and these include concepts of harmony and human dignity. I have complained to the NTR several times, but there is no engagement. The judge today said on the one hand that the plaintiffs should have had prior engagement with the defendants, but said also that the NTR defendants didn’t need to engage with the plaintiffs. This is typical of a judicial reasoning disenfranchising one party. The shameful lack of accountability and adequate legislation within the Dutch system has a greater chance of becoming exposed by the European court. It’s ridiculous, for example, that a local council can grant an events permit, and after the fact, hold consultations to prove that their decision was right. As the decision is already made, it’s obvious that consequent consultations lack substance. The struggle goes on for social justice and although it is difficult we won’t give up. Please tell others about this. This blackface caricature remains a source of human misery. *The Netherlands Institute of Human Rights came to this conclusion after doing a literature study on the effect of stereotyping in regard to access to employment in July 2013.